You must have heard this only about a million times- I do find the need to say it still- You are amazingly talented! I hope to seek some clarifications on my impending order. The intention is to keep it short and precise- so that I don't waste your time- My apologies if I fail terribly at it ;-p.
I emailed you about 2 weeks back- haven't gotten a reply ;-(. Anyhow, I've decided to go ahead with my order :-). love Love LOVE your work! The caricature I have in mind is as follows.. 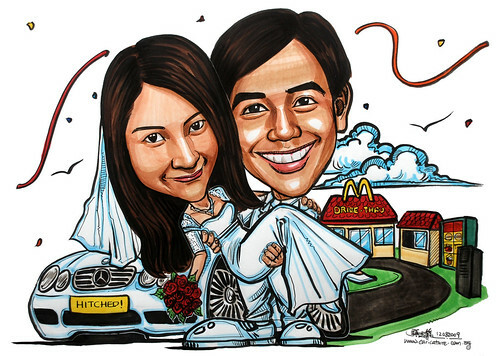 Scenario: Bride and Groom standing by a Pearl-white Merc SL 500 (car1.jpg/car2.jpg) with the words HITCHED! written on the license plate. Groom carrying the bride. 1) Khairul (groom.jpg) in white tux and white sneakers (sneaker1.jpg). Can you draw his hair longer and more floppy as in (groom2.jpg) please. 2) Me (bride.jpg/bride2.jpg) in white wedding gown (gown1.jpg) holding a bouquet of red roses. Can you draw my hair long with big wavy curls at the end please." I miised out her first email. Too many email enquiries (as well as spams) recently. McDonald's Drive-Thru. I draw it out based on the drive-thru opposite my house, but a simplified version. love Love LOVE the drawings! It's perfect. It's what I wanted - everything & more. Thanks :-)"